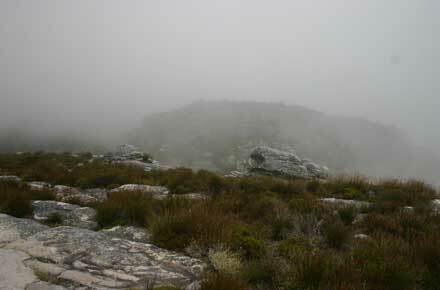 Table Mountain, looming above Cape Town, often sporting in its trademark blanket of cloud, is truly ionic. 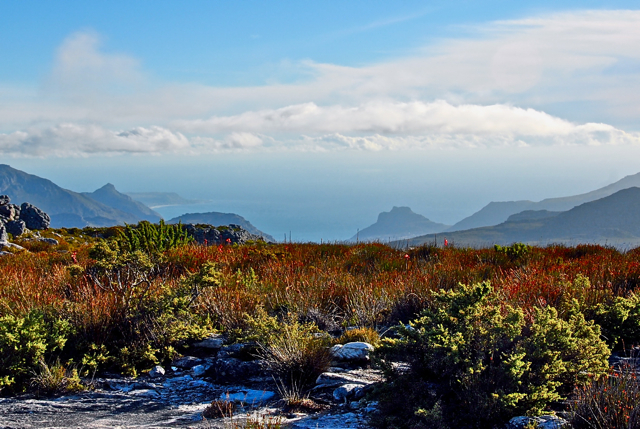 A variety of trails take you up, through changing bands of fascinating fynbos vegetation, into gaps in the famous precipices and then to the broken plateau of the top, with its magnificent views of hills, city and ocean. Or you can pop up on the cable car and follow a selection of the trails on the top. The top is always crowded. Despite that, this is not a walk to miss. 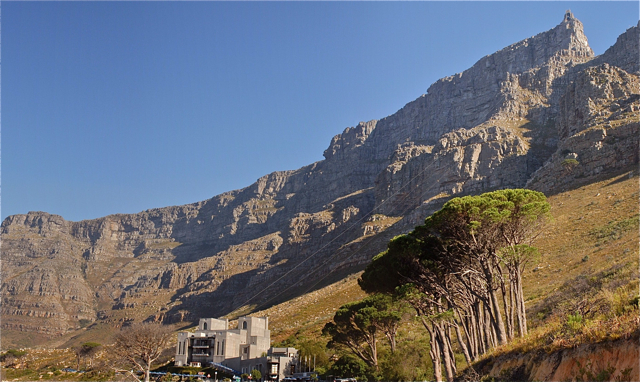 Table Mountain is fascinating and multi-faceted, much more than merely one of the worlds best known landmarks: geological oddity, home of fabulous flora and fauna, platform of stupendous views. At the risk of being miserable carpers, the views and experience are not quite so incredible as they are sold as being. 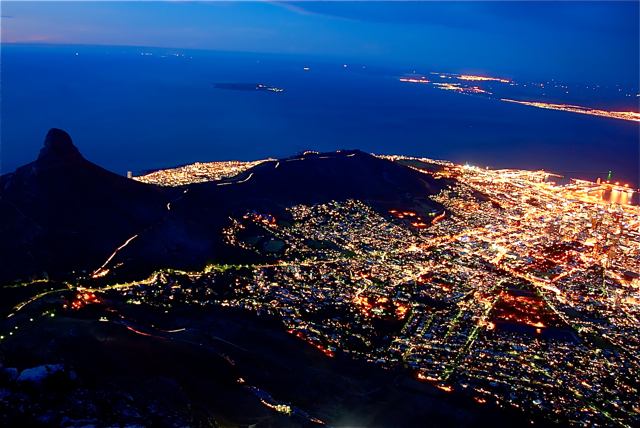 Cape Town is not a specially scenic city. And expect crowds in the cable car area of the top. But it is still a must if you are there. Table Mountain is actually more a very flat looking ridge, with broken hills behind it, than the wide plateau its name suggests. Its upper reaches are composed of hard quartzitic sandstone, so it has eroded more slowly than the surrounding rocks, creating its famous and spectacular cliffs all round, allowing a few access routes through crevices and up its (relatively) gentler back. 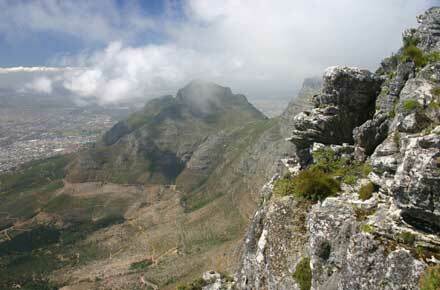 The Table Mountain Natural Park, which extends down the peninsula to Cape Point, is a deserved Natural World Heritage Site. 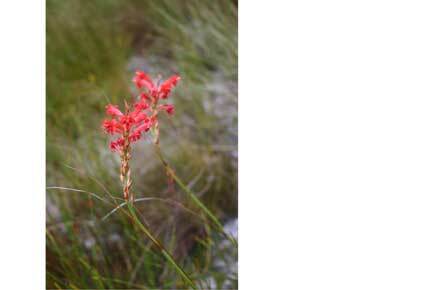 It showcases a fabulous selection (said to be 2,200 species on the mountain alone) of the Cape Floral Kingdom, the smallest but one of the richest of the worlds six main vegetation systems. The fynbos and protea vegetation is varied and very beautiful, especially in its rich spring flowering season. Interesting animals range from rock dassies to puff adders. The changing bands of vegetation are one of the joys of a climb of the mountain. There is a huge variety of possible walks here (see Routes below). The full monty would be to ascend on one path, explore the top then head back down a different face. 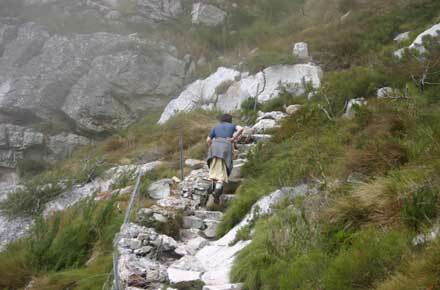 This is not possible for most of us - not least because of transport constraints - and many people walk up and take the cable car down - or even go up and back by cable car, restricting their walking to the mountain top. 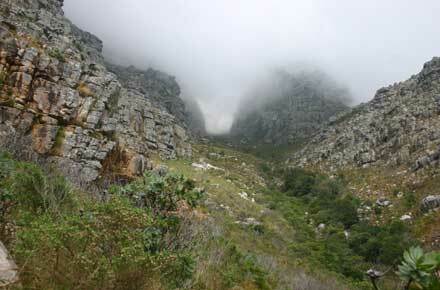 The Platteklip Gorge is the most direct (but popular) route, and has the great advantage of starting near the cable car, so enabling a circuit that includes a descent by car. It can be over-popular but, when we were there, although we saw some other walkers in the distance, it felt as if we had the trail to ourselves. This route takes around 2 hours, winding into an even-narrowing fissure in the cliffs. It is wildly atmosphere as you climb through varying areas of vegetation, entering the gorge between tremendous grey sandstone cliffs, the vast view of the Cape Town basin expanding below you then becoming framed by the gorge walls. 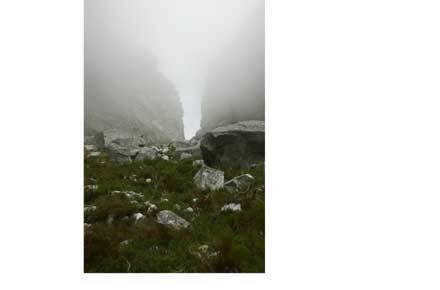 When we were there, the last hundred metres was in cloud, rendering it even more mysterious. Once on top, you should wander around the broken plateau; the obvious destination is the high point of Macleans Beacon at 1,088m. The top is cracked flat sandstone with a multitude of little plants eking a living in its fissures, larger shrubs doing better, thank you very much, in the gullies. Dont be disappointed if the south-eastern winds are blowing moisture which creates the trademark blanket of cloud that hovers on the mountaintop. It happens. It is still worth climbing (but be careful about your directions on top: it may well be best to head straight to the cable car, some 20 mins on well signed paths from ythe top of the Platteklip Gorge). Alternatively, you can follow the magnificent Upper Contour Path along the hillside, just below the cliffs. 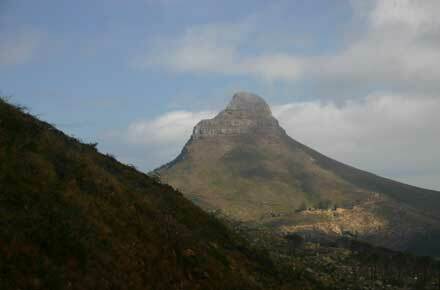 Other, lower, alternatives are the stunning Lions Head and Signal Hill ridge. 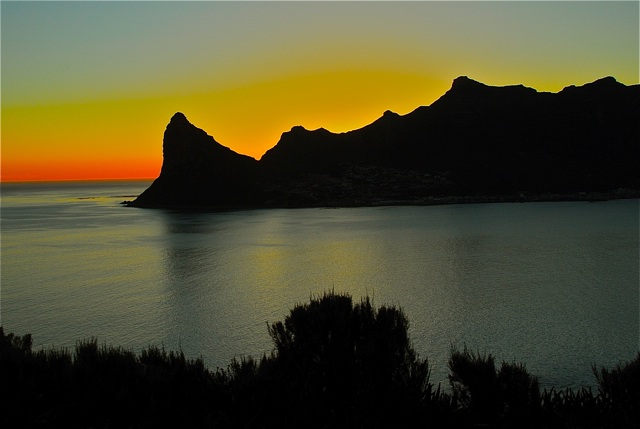 For more information, including practicalities, and photos, see our Cape Peninsula page. With due respect, you ARE miserable capers! Cape Town is not an especially scenic city? That's LUDICROUS! It's vastly the most scenic city I have ever seen in my life, counting Rio, Vancouver, Sydney, Hong Kong, San Francisco and any back home in Europe. The views from the top of this walk are, unimaginably lovely. Even architecturally it is gorgeous, with beautiful seventeenth century homesteads dotted throughout the city, eighteenth century Cape Malay districts and obviously more beautiful nineteenth century architecture than can be written about. Georgian, Edwardian, Contemporary, Art Deco etc, the city is a gem. My presumption is that the author stuck to a few central blocks around the train station, else I cannot POSSIBLY understand saying that the city is not scenic? If you applied the same logic to Paris, Rome or anywhere you'd conclude likewise, which I think is quite daft. Scenically, counting the Geography too, and it is a world non-parreil. I have been on many of the walks featured on this site, and this clearly makes my personal top three. I would rate it far above Santiero Degli Dei for instance, which would be the obvious other walk to compare it to because of the combination of mountain and sea. Also, the point made that the plateau is not very wide and always crowded is absurd? Did you LEAVE the area around the cable car? If one walks even a half mile, the madding crowd is gone. The plateau is 2 miles wide, and 5 miles long. Looking north one has a view of hundreds of mountain peaks in the distance. Heading South, and ideally keeping West, one passes peak after peak along the walk, including all seventeen mountain peaks that make up the '12' apostles. In doing so you are constantly between 3500 and 2500 feet directly above the atlantic, and the views are quite unimaginable. The Ocean is shockingly blue (makes the Mediterranean look dull by comparison) and of course the 'Cape Floral Kingdom' (the world's most dense floral kingdom) is visible everywhere. If you are at all interested in botany, I do not think anywhere in the world is quite as incredible. Geologically the place is a wonderland too. Anyway, I'm on holiday in Cape Town at the moment, and came upon this site thinking about different potential hikes that I have not done on previous trips. I felt I HAD to have a say, as those comments simply make NO sense to me? 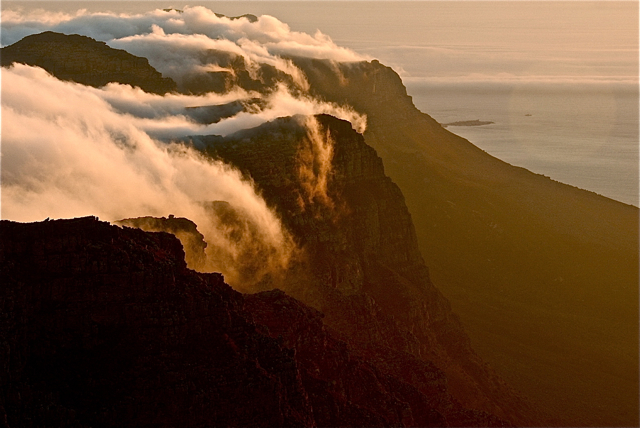 While here I have seen that Table Mountain has officially been named one of the New 7 Wonders of Nature, and it is THE most deserving of all 7 IMHO. Scenically, quite possibly the most beautiful place I have ever been. Walkopedia says: THANK YOU - we love comments such as these. They are invaluable. 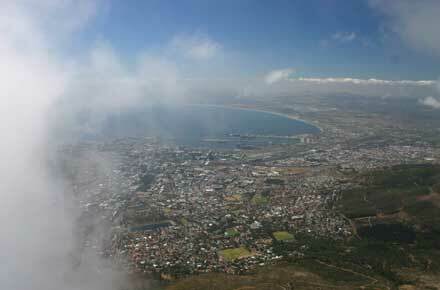 One point is maybe worth making: we were talking abt Cape Town as not specially scenic (as a city) from above. And, in itself, while attracive in places and definitely interesting, it isn't exactly Venice.